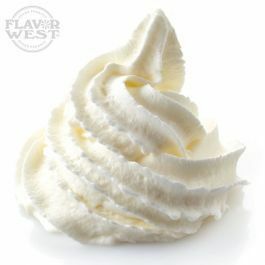 Butter cream flavor adds creamy richness taste to treats. Enjoy the flavor in your sweet frosting, baked treats and more. Type: Butter Cream Soluble Flavoring. Ingredients: Natural and/or Artificial Flavoring, Propylene Glycol and Alcohol. USP Kosher Grade Flavoring. Usage Rate: 15-20% for E-use. Flavor suitability: Desserts, pastries and baked treats, yogurt, ice cream, pudding, drink and beverages, candies and more. Specific Gravity: 1.00 No Refunds on Flavoring. Smooth, sweet, buttery, creamy, right on point. I use this to smooth out dessert flavors needing that extra little bit of sweetness and creaminess. This is a great cream option as it does not cause coil gunking in my experience.